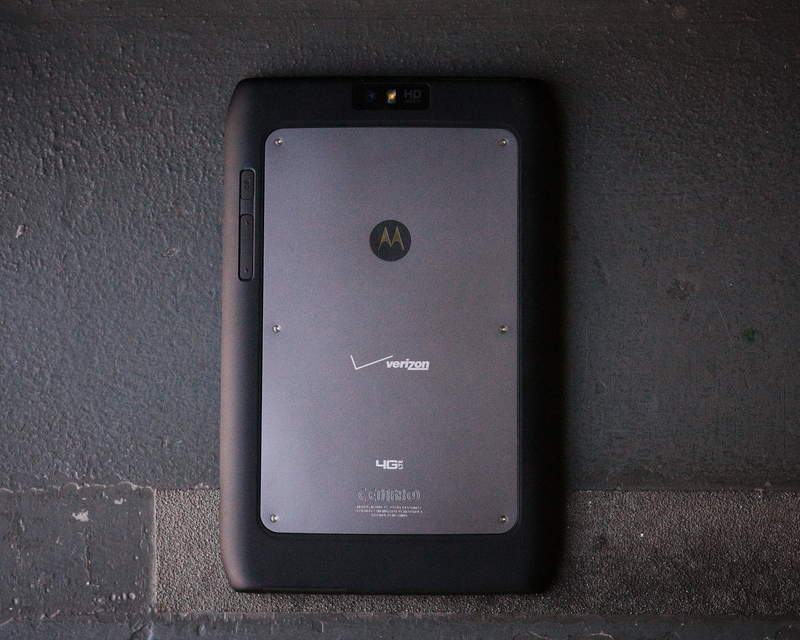 Motorola is taking another shot at the tablet game with the Droid Xyboard, the company’s latest Android device to hit Verizon stores. After getting our hands on one this afternoon, we found that it’s a solid, well-performing slate that’s easy on the eyes. Too bad it has such a stupid name. 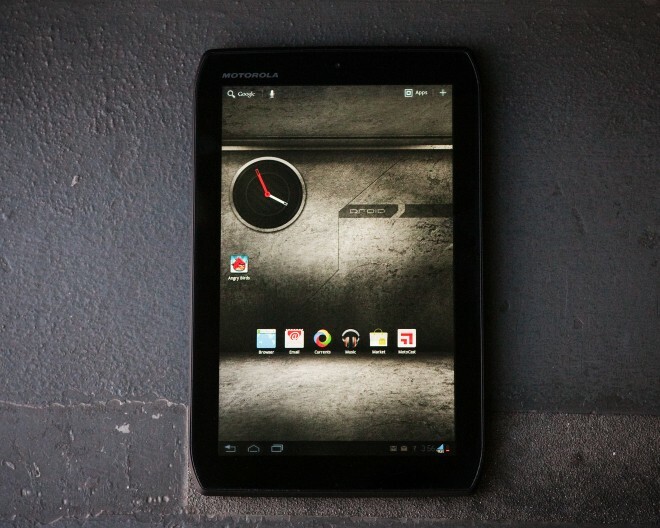 The 4G Xyboard is Motorola’s follow-up to its pricey, not terribly popular Xoom tablet, which was released in February. Available in 8.2-inch and 10.1-inch versions, the Honeycomb-powered Xyboard enters the market hot on the heels of the super-hot Kindle Fire. It’s on sale today for $430 (for the 8.2-inch) or $530 (for the 10.1-inch) with a two-year contract from Verizon, with options for 16GB or 32GB of memory on the smaller version, and up to 64GB on the larger one. The positioning of the device’s only two buttons makes for a clean appearance, but leaves your fingers searching when it’s time to crank up the volume or send it to sleep. The 8.2-inch size, however, is a great compromise between the 7-inch ‘tweeners and 10-inch stunners. It’s small enough to wield in one hand with ease (the 0.86-pound weight helps with that too), yet large enough that watching a full-screen, HD YouTube video or a movie on Netflix is pleasant. Pair that with Verizon’s 4G speeds, and you’ve got great streaming video quality. Unlike HTC and Samsung devices, it’s not overly skinned, so you can actually experience the Android OS for what it is, rather than a bogged down, bloated mess. The Xyboard will be eligible for an Ice Cream Sandwich upgrade at some point in the future, but for now, it runs Honeycomb very well. Both the 8.2- and 10.1-inch models have a 1280 x 800 resolution display. After turning up the brightness from auto to full, the tablet’s battery life dropped from around 20 percent to around 5 percent in less than an hour, so it looks like you’ll need to be conscious of your 4G and brightness settings if you don’t want your tablet to die on you quickly. If you’re one of those people who likes to take pictures with their tablet (read: you are a dork), the Xyboard has a 5-megapixel back-facing camera and a 1.3-megapixel front-facing camera on its face. The rear camera’s quality is relatively sub-par compared to what you’d get from other comparable cameras, and definitely shoddier compared to the 8-megapixel standard of most 2011 handsets. The colors are bright and close to true to life, but the overall image lacks sharpness. The camera does have some variable settings though, for white balance, color effects, and scene mode. Video quality was also just ‘meh’: a video taken indoors at the Wired offices was noticeably grainy. Overall, the Xyboard seems like a decent tablet. The slate looks slick and feels good in your hands, and is powerful enough to provide a successful tablet experience. It’s a bit of a shame that it’s shipping with Honeycomb instead of ICS, but that’s certainly not a deal breaker. What’s a real shame, though, is that it’s available now, and not six months ago.